Punch Club is basically Boxing Tycoon, similar to Game Dev Tycoon. Except in Punch Club, there's a written story to follow, and an ending to the game. Much like Game Dev Tycoon, you'll be micro managing a variety of skills until your the champ. As a tycoon game, Punch Club has a variety of stats and meters to maintain. The most interesting ones being the combat stats of agility, strength, and endurance. What makes these interesting is the fact that they degrade over time, forcing the player to keep up their training routine in order to have their stats at a desired level. Your routine will usually consist of eating, sleeping, training, working, shopping, and fighting. Building your character comes down to what kind of fighter you wish to be. A fast, and accurate jabber? A slow but heavy haymaker? Or purhapes a tanky turtler. It's best to chose one of the 3 conventional builds, as trying to be a jack of all trades will often lead to a failed character. The game's development system can be punishing. If you don't train properly, or don't pay attention to the skill tree, it'll be expensive to fix any errors, as every skill will cost more, the more you invest. Combat plays out automatically, but allows the player to build a combat "deck" from skills attained through the skill tree. Between rounds the player can change up their skills as needed. To say the least, the game certainly has a lot of depth for the player to dive into, but remains accessible enough, that even new comers to the genre could probably get a handle of pretty quickly. The presentation of the game is detailed with well illustrated pixel art, and filled with nostalgia, referances, and easter eggs. 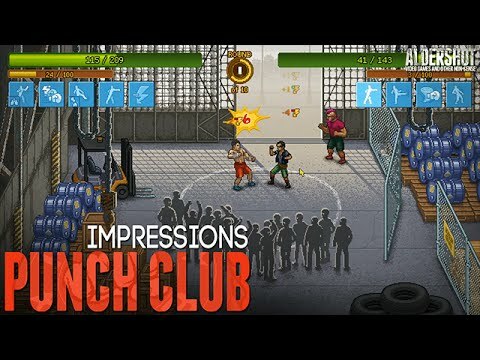 There's a lot to like about Punch Club, the retro aesthetics, the pop culture referances, the depth of the micro-managment, and it's addictive value, but the game is not perfect. I feel like the biggest flaw with the game is easily the repetition. Once you find a comfortable routine that works for you, you'll be sticking to it for the majority of the game, with only rare mini-quests to break up the action. The combat is also unskippable which gets annoying after a little while, especailly considering that the combat is completely automated. Why not give the player the option to skip the the end round results? Though I did find the micromanagment of the game addictive, it was also grindy and at times tedius. Overall Punch Club is a well put togeather career tycoon game, that features great nostalgia, excellent presentation, and addictive gameplay, but can get tidius with a lot of repetition.